If you’re just starting up your business and embarking upon your entrepreneurial journey, then it’s quite possible that you are being faced with multiple tasks that are requiring your immediate attention and you’re not certain what to focus on first or what should take priority over the other in order to get your business up and running. Does that somewhat sum it up for you? 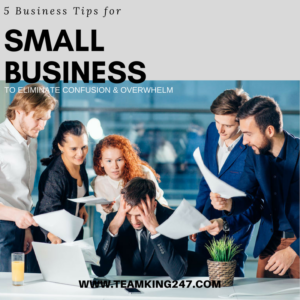 We bet its very close, that’s why we put together these 5 business tips for small business to eliminate confusion and overwhelm. Before we get into the meat and potatoes of the matter, though, we want you to take a deep breath and release any anxiety, frustration, worry, etc. that you may be feeling at this very moment and relax. Once you see these simple marketing ideas, you’ll breeze right through them and your business will begin to flourish. Figure out who’s your target audience – what makes up the ideal client/customer for your specific product or services? Writing it out creates a customer avatar for your business so that no matter what promotional material you put together, the message you write will be tailored to their needs and wants. Create a problem-solving giveaway – this is a freebie that you create that addresses a problem you know your ideal client/customer has that’s specific to your niche but has nothing to do with your products and/or services. It can be an eBook, a checklist, the top 5 reasons why X (where X is a well-known issued your potential client/customer is faced with), a free webinar, free conference call, free/discounted coupon, etc. These are just a few creative campaign ideas that you can use as your marketing lead strategies. Decide how you intend to expose your target audience to your problem-solving giveaway – decide what platform do you intend to use to market your freebie. Will it be YouTube, social media sites like FaceBook, Instagram, Snapchat, Twitter, etc., a blog post, podcast. Whatever method you intend to use, continue to do so until you start getting leads. Continue creating problem solving content – now that you know your target audience pain points, continue writing, creating, filming, recording, etc, problem solving content. When you do, it will establish you as an authority figure within your specific niche. Drive traffic – paid or free, begin driving traffic to your platform of choice, offering your free giveaway in exchange for your potential client/customer’s email address and/or phone number. Every business needs a list. There’s a saying that says “the money is in the list” and that list allows you to continually market to your prospects over and over and over again. Once you implement these 5 tips, then trying to figure out what requires your immediate focus or what takes priority over the other, will be a non-issue for you. Give your target audience value that they can learn and grow from and they’ll be back for more seeking you out vs. your competitor to purchase your products and services. We hope you found today’s post on 5 Business Tips for Small Business to Eliminate Confusion & Overwhelm informative. If you found today’s post to be of value to you, then we would love for you to leave a comment below. Also, if you believe this information would be a blessing to someone else, then feel free to share it with others.